An analysis of their Income Tax returns and donations statements filed with the Election Commission of India (ECI) shows that the sources remain largely unknown. At present, political parties are not required to reveal the name of individuals or organizations giving less than Rs. 20,000 nor those who donated via Electoral Bonds. As a result, more than 50% of the funds cannot be traced and are from ‘unknown’ sources. 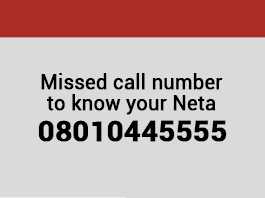 While the National Political Parties were brought under the RTI Act by the CIC ruling in June 2013, they have still not complied with the decision. Full transparency is, unfortunately, not possible under the current laws, and it is only the RTI that can keep citizens informed. Between FY 2004-05 and 2017-18, the National Parties have collected Rs 8721.14 cr from unknown sources (links to reports given in ‘Reference’). During FY 2017-18, BJP declared Rs 553.38 cr as income from unknown sources which is 80% of the total income of National Parties from unknown sources (Rs 689.44 cr). This income of BJP forms more than 4 times the aggregate of income from unknown sources declared by the other 5 National Parties. Out of Rs 689.44 cr as income from unknown sources, share of income from Electoral Bonds was Rs 215 cr or 31%. For this analysis, 6 National Parties were considered, less CPM, as the ‘Schedules’ or ‘Annexures’ were unavailable for CPM for FY 2017-18. Schedules contain specific details of income from various sources, without which ADR was unable to analyse sources of funding of CPM. Total income of political parties from known donors (details of donors as available from contribution report submitted by parties to Election Commission): Rs 467.13 cr, which is 36% of the total income of the parties. Total income of political parties from other known sources (e.g., sale of assets, membership fees, bank interest, sale of publications, party levy etc. ): Rs 136.48 cr, or 11% of total income. 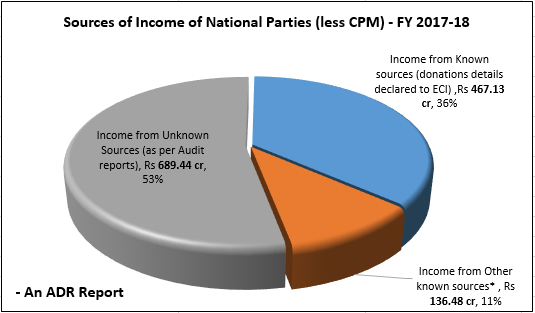 Total income of political parties from unknown sources (income specified in the IT Returns whose sources are unknown): Rs 689.44 cr, which is 53% of the total income of the parties. Out of Rs 689.44 cr as income from unknown sources, share of income from Electoral Bonds: Rs 215 cr or 31%. Since a very large percentage of the income of political parties cannot be traced to the original donor, full details of all donors should be made available for public scrutiny under the RTI. Some countries where this is done include Bhutan, Nepal, Germany, France, Italy, Brazil, Bulgaria, the US and Japan. In none of these countries is it possible for more than 50% of the source of funds to be unknown, but at present it is so in India. Mode of payment of all donations (above and below Rs 20,000), income from sale of coupons, membership fees, etc. should be declared by the parties in the ‘Schedules’ of their audit reports, submitted annually to the Income Tax department and the ECI.